As General Officer Commanding the troops based in New Zealand, Alfred Robin was the person with the most direct overall responsibility for New Zealand’s military war effort after the Minister of Defence. A strong and capable officer, Robin was unhappy about being stuck at home while war raged elsewhere. Robin was born in Victoria in 1860 and came to New Zealand as a baby. His early interest in the military drew him into volunteer units in Otago and Southland from the late 1870s, and by the 1890s he was commanding officer of the Otago Hussars. Robin commanded the First Contingent despatched to the South African War in 1899, and from 1900 the lst New Zealand Regiment. On his return to New Zealand he moved into national defence administration and was Chief of the General Staff from 1906.. 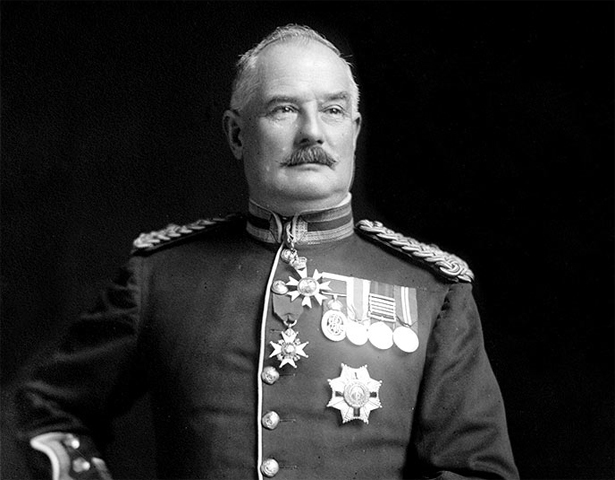 Appointed adjutant and quartermaster-general under Major-General Godley in 1910, Robin helped bring the 1909 defence scheme to fruition. From 1912 until early 1914 he was New Zealand representative at the War Office in London. On his return to the dominion in early 1914 he resumed his earlier role as quartermaster-general. As well as being in overall charge, Robin had direct responsibility for a third of the department’s work – keeping the camps supplied with equipment and food. In early 1918 the government appointed a Defence Expenditure Commission to review the whole system. While complimentary about Robin personally, the Commission concluded that the department was over-centralised and excessively dependent on him. Robin told the Commission that being stuck at home rather than commanding troops at the front had been ‘a serious blow’ – he had had to set aside years of training and military experience to serve as an administrator. Promoted several times during the war, he stayed on only long enough to see the department’s war work completed. Robin resigned in late 1919 and retired a year later after a brief stint as acting administrator of Western Samoa. During the 1920s he was active in veterans’ associations, the Boy Scouts and St John. Robin died in Wellington in 1935. We have 5 biographies, 21 articles, related to Alfred William Robin.